Over the last couple of summers, I’ve been involved with a redesign and refresh of both the Palm and Valley courses at Marriott Desert Springs in Palm Desert, California. Both of these tracts were originally designed by my father in the mid eighties and are now about 25 years old. One of the interesting aspects of a golf course is that they are living entities that continually change over time. Of course, one can easily note growth in trees and shrubbery, but other changes can be more subtle yet every bit as dramatic if one knows where to look. In an effort to highlight some of these shifts and how they affect play, this posting, focused on greens, is the first of two intended to illustrate the impact of age on the golf course. A second, on bunkers, will follow in coming days. It is a very common tendency for greens to shrink in size with age. There are several reasons why this change occurs, but one of the initial causes is the general maintenance practice of mowing slightly inside the existing edge in an effort to avoid scalping the apron. Often, the impact is greatest in areas with concave edges as it is harder to for the mower to consistently track an inside curve. The practical result is a very subtle shrinking and rounding of the putting surface. This tendency seems like a small issue especially when the differential may be minuscule (1/64 of an inch, perhaps) and cannot be seen on a daily or even weekly basis; but, with a compounding effect over many years, the physical edge of a green may shift by a significant amount. A few years ago, I pointed to a spot 10 feet outside the current edge of the putting surface and watched as the superintendent punched the turf to find, in amazement, the original sand core extended that far away. However, while the tendency for greens to become smaller due to mowing practices is common, it is not the only cause of shrinkage. Top dressing also raises the putting surface and will tend to flatten and crown the green over time. Again, the impacts cannot be seen on a short term basis, but successive layering over the years can raise the putting surface by many inches. In fact, the better and more regular the maintenance practice, the greater the change. Often, mowing patterns will be modified to compensate for this rise, which will further shrink and round the putting surface. The cumulative result of these issues can have a significant impact in reducing the size of the green with a practical loss of strategy because hazards are further from the pin setting areas. It is also common for interior contouring, the ridges and slopes originally built into the green surface, to flatten and disappear. From a maintenance perspective, the loss of “pin-able” area also reduces the recovery time between placements making the maintenance process much more difficult. 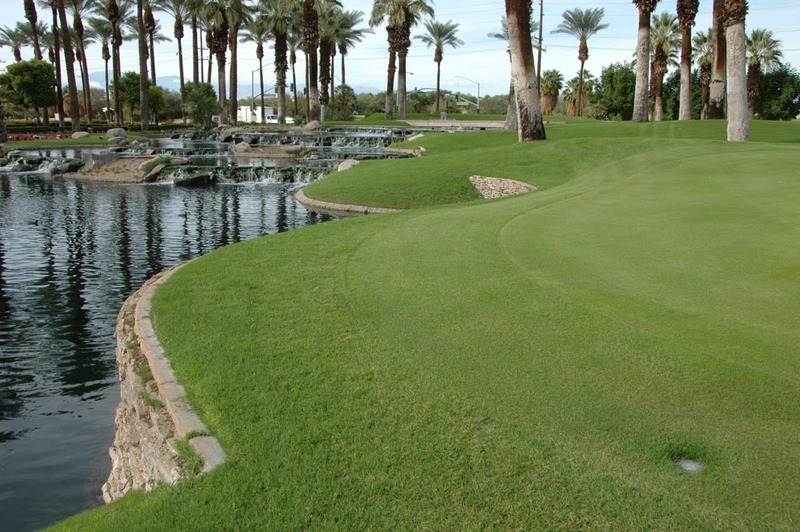 To the right is a print of the original green design for the third hole of the Palm Course at Marriott Desert Springs. Please note the edge of the putting surface in the lower left corner extends all the way to a wall, which, while not noted, borders a lake. A hole like this one, where the green abuts a hard edge, offers a good illustration of the effects of age as it provides a fixed reference point by which one can easily note the impacts. In the photo below of this same area, the cumulative effect of top dressing is clearly noticeable: the original putting surface has risen 8-10 inches causing the green to crown. 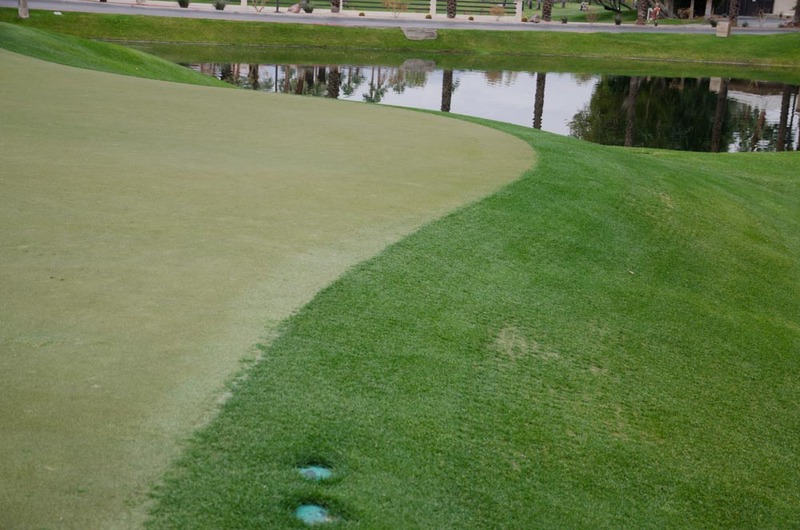 In an effort to prevent the ball from rolling in the water, the slope has been grown out and an apron (not intended in this area) was added thus moving the edge of the green several feet from its original design and causing the “pin-able” area to shrink. 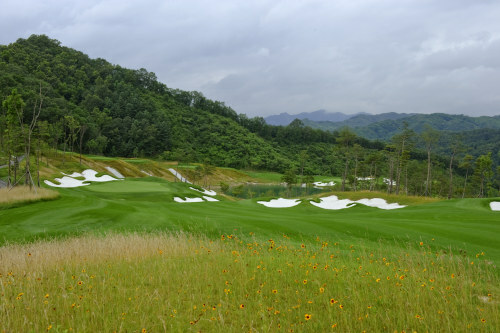 As the green edge is now further from the lake edge, much of the original design strategy has been muted and the hole is easier to play. Another interesting item of note is the fact the sprinkler head has been shifted inward from it’s original location to a position more appropriate to the green. Although I haven’t provided pictures, there were other similar impacts to this green most specifically in the concave areas and next to the back bunker, which ended up about six feet from the green edge (verses around two in the original design). 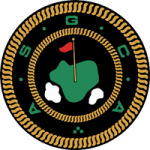 The compound result of these small cumulative shifts was to shrink the putting surface from its original design size of about 5,200 square feet by about 20% to under 4,000 square feet. In the summer of 2011, this green was returned to its original size and initial design intent, which is pictured below. As I mentioned earlier, the reason for using this particular hole as an illustration is the fixed edge allows the changes to be easily seen. However, one should be aware a similar shift occurs in any area where the slope falls off from the green edge. 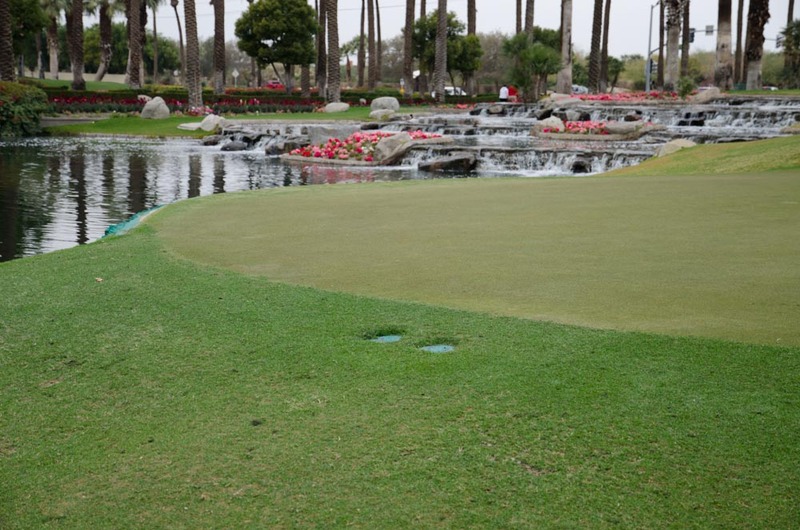 For instance, if the approach to the green rises at a normal slope of four or five to one, a rise in the green surface of ten inches will push the green edge at least four feet from it’s original position. 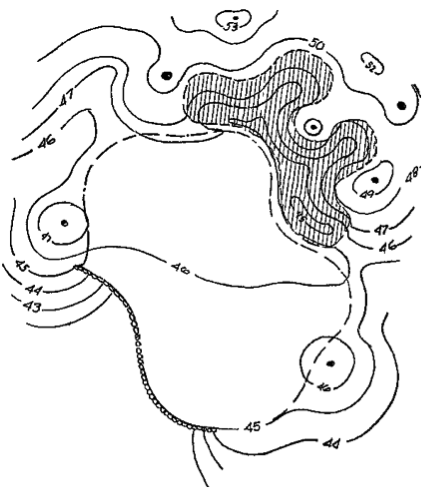 The picture below (Desert Springs-Palm 6) of a slope falling off at about 4:1 from the green is typical of a feature where one would expect this shift to occur (as it happens, the edge had been pushed over five feet form it’s original position due to a combination of its concave shape and a sloping boundary). So, on an existing project of a similar age, would one expect to see similar results? Absolutely! If the greens on a course seem somewhat small, flat, rounded and not directly relating to the surrounding hazards, one can be sure normal aging is the cause. If you wish to get an idea of how much the course has shifted (and absent a wall), one way is to locate the sprinkler heads and note how far they are from the edge of the putting surface. As in the picture above, normal spacing is about 12 inches (30 centimeters). If the greens have a sand core, they can also be punched to see where the sand ends. These days, we run a 12 or 14 gauge rubber coated wire around the edge before filling with sand or greens mix so the edges can be located with a metal detector. golf course aging, Golf Design, Marriott Desert Springs, Robinson Golf, Ted Robinson Jr.